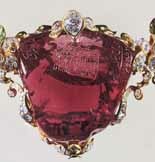 The Timur Ruby is not a ruby but a spinel, although until 1851, it was thought to be the largest known ruby. It weighs 352.50 carats and ranks second in size behind the 398.72-carat spinel in the Imperial Russian Crown. It is not faceted, but retains its original baroque shape, similar to the Black Prince's Ruby, which weighs around 170 carats. The Timur Ruby has a history paralleling that of the Koh-I-Noor Diamond, having been seized by Nadir Shah of Persia in 1739 when he invaded India. As with the Koh-I-Noor, the East India Company took possession of the gem in 1849 and sent it to England. It went unrecognized there and together with three other spinels was listed in the official catalogue as: "Short necklace of four very large spinelle rubies." The stone remained in obscurity for 60 years before it was recognized from the inscription it bears. These inscriptions are among the most fascinating aspects of this gem, and gives further insight into its history. The longest inscription is in Persian, written in Arabic script. A literal translation reads: "This (is) the ruby from the twenty-five thousand genuine jewels of the King of Kings the Sultan Sahib Qiran which is in the year 1153 (1740 AD) from (the collection of) jewels of Hindustan reached this place (Isfahan)." The remaining five inscriptions are the names of some of the emperors who had it in their possession, and the corresponding dates, the first being Akbar Shah Jahangir Shah, 1021 (1612 AD). It is thought that the gem once bore the dates of three earlier owners. The long inscription tells us that this spinel is the famous stone that fell into the hands of the tartar conqueror Timur, known to European history as Tamerlane, but to the Muslim world as Sahib Qiran, when he captured Delhi in 1398. The emperor Shah Jahan had the jewel from 1628-58. He built the famous Peacock Throne in Delhi and embellished it with a number of gems, including the Timur Ruby. Nadir Shah invaded India and captured Delhi in 1739 and took the Timur Ruby back with him to Persia. From that point, the history of the Timur Ruby parallels that of the Koh-I-Noor Diamond.